Leupold VX-R 4-12x50mm Matte Riflescope Review - Worth The Price? The Leupold VX-R-12x50mm Matte Riflescope is a benchmark in the evolution of riflescopes. It has sophisticated features that make different types of long range shooting more precise and enjoyable. With this illuminated reticle you can get unimaginable accuracy that was simply unattainable just a few years ago. The riflescope has an index matches as well as edge blackened lenses. These lenses are lead free. The Leupold VX-R 4-12x50mm Matte Riflescope comes with an amazing actual magnification of 4x to 12x magnification which is more than many other riflescopes in its price range. This makes it a very good option for your long range shooting trips. Its resolution is practically as god as it gets letting you be able to distinguish all the things in your view. With this riflescope, you have a wide field of view of 22 feet at 100 yards. This comes in very handy when you are scouring the range for your target. The objective lens diameter of the Leupold VX-R is a stunning 50mm. This is ten more millimeters than what most scopes have. This means that your viewing will be much brighter as there is plenty of space for light to come through the scope to let you see brighter images. The Leupold VX-R 4-12x50mm rifle scope has a very comfortable eye relief of up to 4.1 inches. Once again this beats many other riflescopes allowing you to be safely away from the scope in case of heavy recoil that can make the scope hit your brow. It is also very important when it comes to taking shots from those angles that would otherwise be impossible if you did not have a lengthy eye relief. The precision adjustments are state of the art. You have an illumination turret that is highly accurate. It is finger adjustable and has 1 / 4 MOA or 1cm per click for the models that have the firedot. The Leupold VX-R 4-12x50mm riflescope also boasts a load of game changing innovations when it comes to the optical coatings. The riflescope has lead free glass (for environmental protection) with a diamond coat lens protection. This makes it extremely resistant to scratches and breakage. It also has index matched lenses that are blackened on the edges. In addition to allowing for high light transmission through the scope to let you see images brightly, you also have the Leupold fire dot that will alert you when the highest brightness is achieved or when you have reached the lowest brightness when aiming. The scope is also second generation waterproof and fog proof. 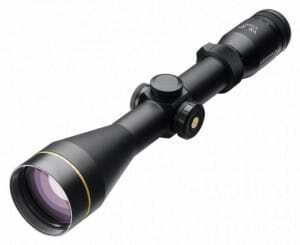 When you buy the Leupold VX-R riflescope, it is only wise to get the Leupold standard rings as well. This will make for easy mounting of the Riflescope onto your rifles. You can also find them in a matte finish to match your riflescope so that you keep up your camouflage. They are extremely cheap considering their quality and their durability will make sure that you can use them as long as you can use your riflescope. You can find the Leupold standard mounting rings here . The Leupold FireDot is a true game changer as it illuminates a dot in the middle of your target even in broad daylight. This gives you impeccable accuracy that ensures that you can practically never miss your target again. The blinking that alerts you when you are at maximum or minimum brightness is also helpful. The only con to this riflescope is that it costs a pretty penny but good things are almost never cheap so it’s a worthy investment. 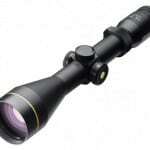 The Leupold VX-R Riflescope currently has an outstanding rating of 5 out of 5 stars on Amazon. Below are just a few of the comments that come from those who have bought it. Click here to find current pricing and more information on the Leupold VX-R 4-12x50mm Matte Riflescope . Check out our other rifle scope reviews if you want more in-depth analysis of different hunting scopes.